Place your eggs in a pan of boiling water for 5 minutes then immediately place in ice cold water. Skin the sausages and place them in a large bowl. Finely chop the shallots, coriander stalks, garlic and chillies then add them to a frying pan with a little oil. Add in your spices as the onion begin to soften and cook for another 3 minutes. Take out of the pan and allow to cool. Once cool mix the onions in with the sausage meat. You will have to get your hands involved to make sure the spiced onions are well mixed though. Add plenty of salt and a little pepper. In a blender add the pork scratchings and blitz. The mixture might seem a little pasty but you will be able to work it in with the breadcrumbs. Set out 3 plates. The first with flour, second with beaten egg and the third with the breadcrumb and pork scratching mix. On a flat surface lay out some clingfilm. Take come of your sausage meat and flatten it out on the clingfilm so its about 1.5cm in thickness. Roll the egg in a little flour then place in the middle of the sausage meat. Carefully bring up the sides of the clingfilm and wrap the egg. Use your hands to work the meat so there are no gaps. Roll the scotch egg first in the flour then egg and finally the crumbs. Make sure to push the crumbs in a little with your hands. Repeat the process for the remaining eggs. Pop them in the fridge while you heat your deep fat frier or pan to 170 degrees. 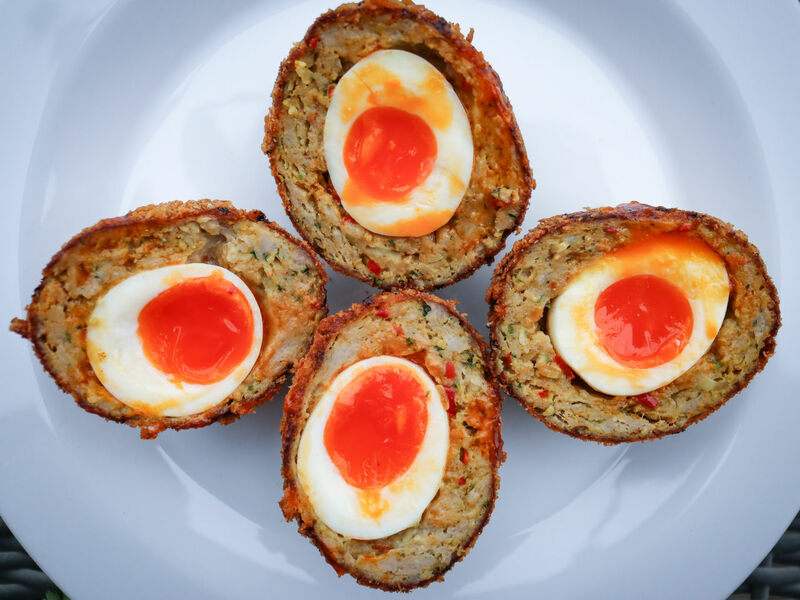 Cook each scotch egg for around 6-7 minutes. Place each egg on some kitchen paper to cool. Then get ready to cut them in half revealing a nice soft yolk!